A display of lures collected by guides Abe and Ted Eberly from the 1930’s on. Some of them were made by the Eberly’s. 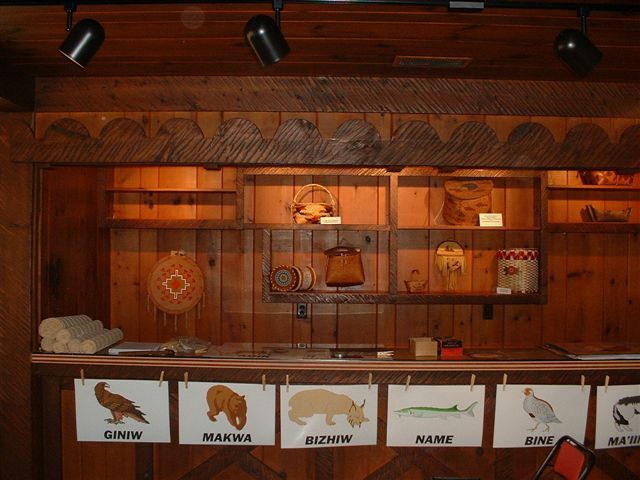 The collection was loaned to the Guide’s Exhibit at the Land O’ Lakes NorthernWaters Museum by the Bill Martin family. 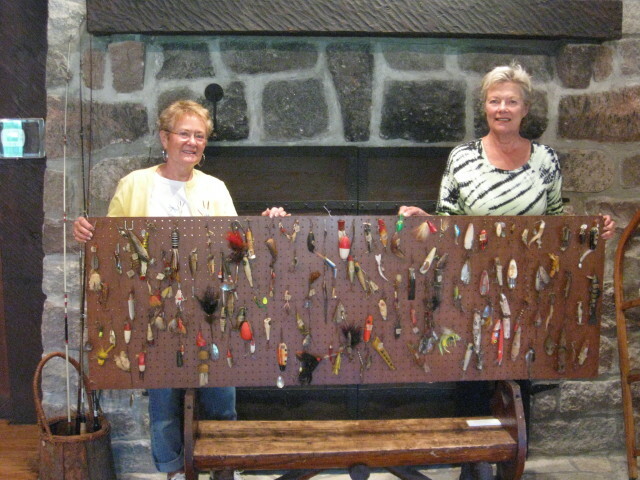 Pictured below is Barb Wilkinson and Sandie Pauly accepting the lure display. 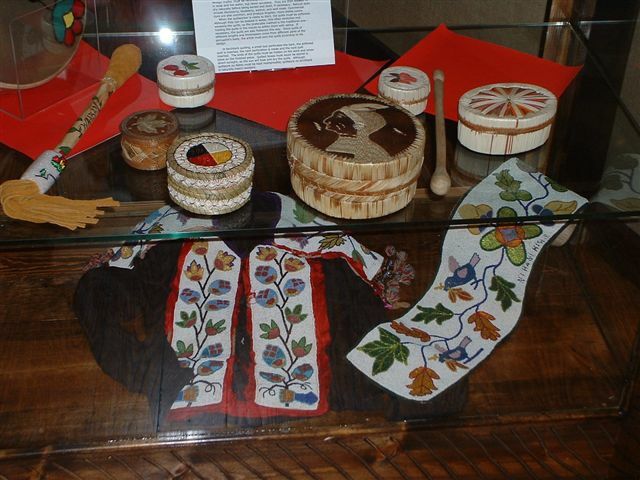 Our “Following the Megis Shell” exhibit was an ambitious joint-venture between the Land O’ Lakes Historical Society and the Lac Vieux Desert band of the Ojibwa people. Barb Nehring took charge of that exhibit, and it became the most visited exhibit in museum history. That exhibit was featured during the summers of 2007 and 2008. 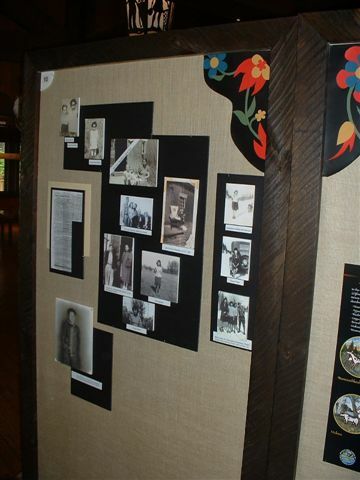 We launched an exhibit during the summer of 2005 dealing with Historic Archaeology on the Conserve School campus. Paul McLeod’s archaeology class began exavations of a 19th century homestead during the summer of 2004 and that project will continue for several years to come. That exhibit gave a look at some of the preliminary findings of that project. 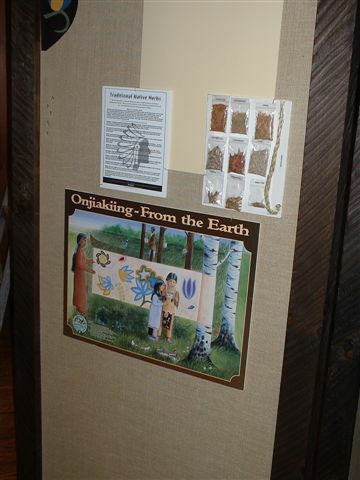 During the summer of 2004, we exhibited our investigation of the history of Land O’ Lakes area logging. The exhibit featured maps, images, oral histories, and analysis of the sawmills, the lumber camps, and the logging railroads. These railroads were active between the 1880s and the 1920s, and a complex network of rail lines brought area logs to mills in Land O’ Lakes, Rhinelander, Phelps, and Star Lake. Paul McLeod and Marilyn Annin researched and built that exhibit. The dot on the map which is now Land O’ Lakes first started showing-up on maps around the time the railroad arrived in 1883. Within a couple of years, opportunists built the first sawmill, and within a couple of years after that, they built the first logging railroads. The logging history of this area is an epic story. As of this writing, many archaeological sites dating to the logging boom of the era 1886-1920 are still visible throughout the area. The exhibit featured photographs, maps, correspondence, artifacts, and interpretations of the rise and fall of this great industry. In an attempt to make this exhibit significant to this specific area, Paul McLeod collected a series of archival images from a group of generous collectors, museums, and local folk which document logging in the Land O’ Lakes area. Most of these images have never been published. The museum’s mission states that we are dedicated to ongoing research, so part of the purpose of this exhibit was to encourage others to pick-up where the exhibit left off. This was an exciting project, and we fully expect the patrons to continue to add to our database of facts, memories, images, and artifacts as we move ahead. Our third exhibit which also ran during 2003 dealt with the diaries of two early residents of Land O’ Lakes. These were Claude Warren, minister of the Ely Church, and Deborah Ferry, longtime summer resident on Black Oak Lake. Excerpts from their diaries dating to the 1920s and 1930s were featured along with unpublished images from the archives of the historical society. Our second exhibit on Barefoot Charlie was thoroughly researched by a team of distinguished and attractive local historians including Pat Juday, Paul McLeod, and Marilyn Annin (designer). 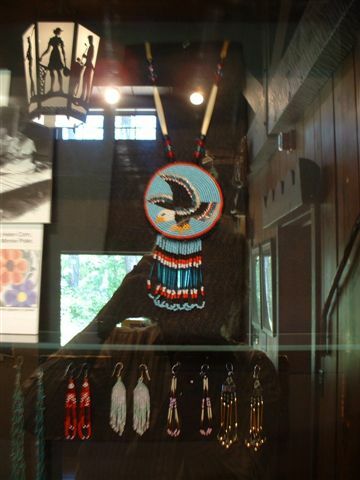 The exhibit was launched in May, 2002, and was featured during the 2003 season as well. More than 2000 visitors saw the exhibit in 2003. Our first exhibit on Vilas area geology took a look at our three billion-year timespan from the ancient Archean bedrock to the relatively recent glacial landforms. This exhibit was a big success, and while it has now been taken down, you can still access geology images and information through the museum.